Okinawa, Japan's most exotic and southernmost prefecture, has produced more than its fair share of pop musicians over the last decade. Amuro Namie, Speed, and Hajime Chitose, to name just a few. In 2004, six-man pop-rock unit Orange Range "arrived" in style to become the latest addition to the lineup. They won that year's New Artist of the Year accolade at the 18th annual Japan Gold Disc Awards. They joined the illustrious list of Okinawan artists to have taken the award: Kiroro (1999), Da Pump (1998), Speed (1997), and Begin (1991). In spring 2005 they won again at the Gold Disc Awards, their combined CD sales from the previous year putting them at the top of the pile: a whopping 4.5 million singles and albums earned them the Artist of the Year award. The six original members -- Hiroki (Mid Vox), Naoto (g.), Yoh (b. ), Yamato (High Vox), Ryo (Low Vox) and Katchan (dr.) -- have known each other since childhood, growing up together in Okinawa City. They started playing music together at a junior high school graduation, forming a group in 2001. Within a year, they had already played 70 gigs at the many live houses around Okinawa. The fact that the majority of the US military in Japan is based in Okinawa means that there is a quite different social mix than on the mainland. This applies to music too, with a lot of rock, blues, and hip hop mixing with local traditional music. Orange Range reflect this mish-mash of influences and play anything from pop to rock to hip hop. They borrow heavily from other sources, part of the game in western music, but less common in Japan. With a growing local fan base, they released a mini-album, "Orange Ball," with indie label Spice Records on 22/2/2002, presumably a fortuitous date of some kind. Playing the summer festivals in 2003, they held their own with established acts and were picked up by major label Sony (on their gr8! records division), who no doubt were hoping to cash in on the Okinawan music boom. But group leader Hiroki insisted, "I express the words and music with no influence from Okinawan music. It comes out naturally from inside me." 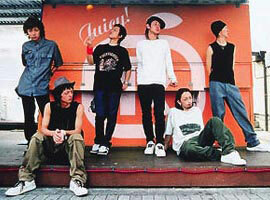 The first single "Kirikirimai" saw poor sales and only made No.50 on the Oricon charts. But that disappointment was forgotten when the follow up "Shanghai Honey" made the Top 5. A couple more singles followed, along with anime and commercial tie-ups, and their major label debut album 1st Contact managed decent if not spectacular sales. But their next album Musiq proved that the band's message was reaching a lot of people. It sold over 2.6 million copies, more than four times the sales of their debut album, and produced four No.1 singles. Their first hit from the album was Michishirube - A Road Home, which was used on the Fuji TV drama "Fire Boys" and their songs seemed to be everywhere - in hit movies (Ima Aini Ikimasu), anime shows (Naruto, Bleach) and TV commercials (soft drink Match). The group found a new kind of status at the end of 2004. Their hometown of Okinawa City was heading into its 30th anniversary and was looking for a good promo event to mark the occasion. Orange Range's appearance on NHK's traditional New Year's Eve song spectacular Kouhaku Uta Gassen (Red vs White Song Contest) was broadcast live to the country from downtown Okinawa. Orange Range were on top of their game. But sales and the band's presence have since declined. Asterisk, released in February 2005, sold more than 600,000 copies but none of the ten singles since have broken the half-million mark. A pair of compilation albums released in 2007, Orange and Range sold a little over 200,000 copies each. Original drummer Kitao "Katchan" Kazuhito left in 2005, the reason originally said to be tendinitis. It was later revealed that he was unhappy with the band's move towards hip hop and away from rock. He returned to the music scene in 2008 with the five-member band KCB.